I don't know why we're never eaten here before - it's a place I've known of since it opened almost 3 years ago. I've always had it in my mind to go here but just never got around to it. Tonight that changes. Estivo is located in what was previously (for 27 years!) a restaurant called Kew's and you'd be hard pressed to recognise it. and what must be the largest mound of salt I've seen set on a table. I would highly doubt the kitchen is under seasoning the food, I think unfortunately, it would be more of a reflection on the palates of the diners. We order 2 glasses of Yarrabank Cuvee to start off as we peruse the menu - indeed we have a good problem that there are quite a few dishes we'd like to try. After some negotiation we finally settle on our meal choices - we also order a bottle of Kangarilla Road 2006 Zinfandel. 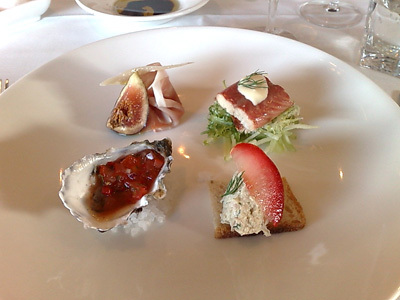 I have the Tapas Plate - it consists of an oyster with a gazpacho dressing, prosciutto with fig and parmesan, smoked eel on endive and shredded apple and pork rillettes with plum. The two stand outs were the smoked eel - unbelievable soft with a fabulous smoky taste and the pork rillettes - just the right amount of dill to compliment the richness of the pork. One negative is the salt that is underneath oyster - it is loosely packed and so shifts on the plate as soon as you lift the oyster. 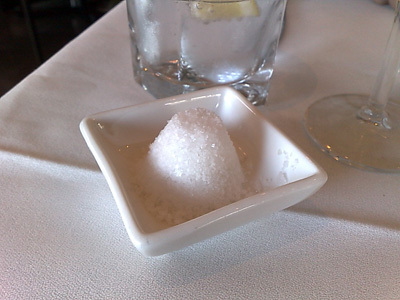 This means you get bits of salt crystals contaminating the other items - crunching on salt when you don't expect it isn't a pleasant experience. They need to find some way to make the salt stick together. Paalo has the Gnocchi with a ragu of Baby Goat and peas (entrée size - it can also be ordered as a main) - this is a special for the night, it usually comes with a pork and veal sausage ragu with peas and walnuts. 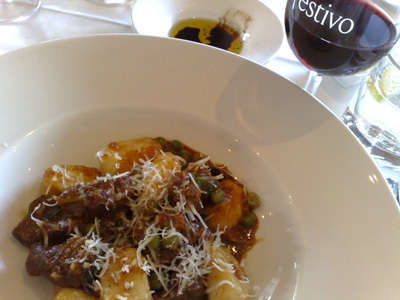 Although the gnocchi are much larger than anything I'm used to, they are soft and light and taste of potato. They are excellent. The baby goat is also very tender. I have the Twice cooked duck - it is first braised in a stock of star anise and then roasted. It is served with corn mush and broccolini and a wonderfully rich reduction. 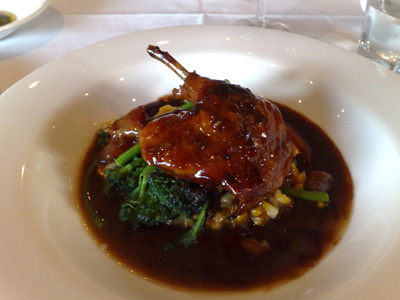 The duck was ultra tender, the sauce gorgeously thick with a touch of sweetness. 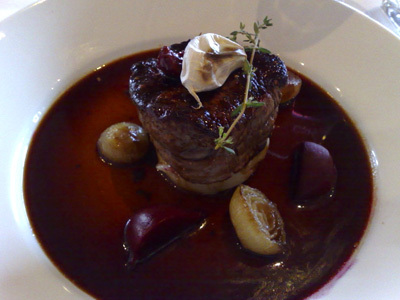 Paalo has the Eye Fillet (cooked rare) served with Confit potat, beetroot, roasted onion and beetroot reduction. It was great to see that the fillet was indeed cooked rare - the maître d' coming to our table to ask if it had been cooked rare enough. 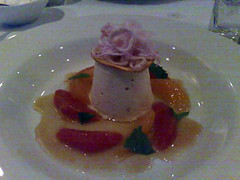 It was sad but not all that surprising to hear that ordering it rare is something that happens rarely here and he lamented the fact that people order it well done! Such a beautiful piece of meat doesn't deserve to be treated that way. 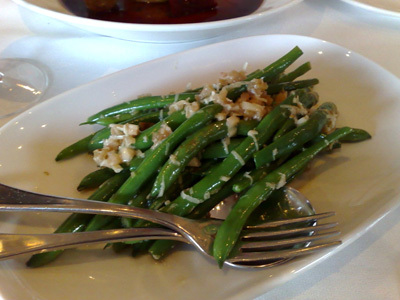 We seem to be on a bean kick so for a side dish we order the beans with pecorino and shallots. Lovely and glossy with still a bit of bite in them. 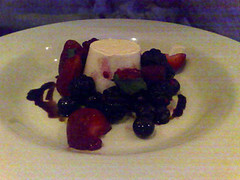 On the left is Paalo's choice of panna cotta with berries and I ordered the frozen nougatine topped with Turkish fairy floss and served with a blood orange salad. Both were well executed and provided a nice finish to the meal. It may well have taken a while to dine here but we certainly will be returning.